"What you do may mean nothing to the world. What matters is that it means everything to you." "What I write is mine... What you read is yours..."
The incessant pitter-patter of the rain broke the stillness in the room. Rivulets of water cruised down the window panes steadily creating zigzag patterns. The glistening free drops clung to the glass refusing to join the rivulets, reflecting the glow of the sun playing hide and seek between the clouds. Samar stretched himself on the couch lazily watching the scene unfolding in front of him mesmerized by it. There was something beautiful about the rain song. The distant melody was continuous and calming, yet haunting in its steadiness. The elements outside were slowly mixing with his blood and traveling through his vein, bringing a serene lullaby in his love-struck mind. Samar saw visions of his love etched on the window. The rivulets were caressing her profile, the gentle winds kissing her cheeks and her half-opened lips. If love could do this to anyone he wished it a hundred times over to everyone else, to sink, to float and rise in its enveloping warmth. He was afraid to move a muscle, for fear of loosing the ethereal vision. He stayed in the position for what seemed an eternity, then slowly retuning from his reverie he looked at the clock. The hands of the clock slowly moved towards the countdown. She had said she would meet him at six. If he could will the clock to move a tad faster; if only he had the power to change it all to make the meeting sooner yet slower, so it lingered on until he was smothered by it. The power of love he said, smiled and pulled himself up. Samar fished out his black umbrella and stepped out into the rain. The rain hadn’t let down. There was something magical in the way the big drops fell from the sky in a continuous stream, as if it wanted to empty every bit of happy tears onto the earth. When it hit the umbrella, the drops annoyed at the obstruction loudly protested and rolled away. He jumped over puddles and quickly found his footsteps taking him towards more puddles, just to side-step it in perverse glee. His heart was as light as a feather and a heat suffused from his depths. Was she going to wear the white dress with the little red buttons on her shoulder? ‘I hope she will,’ his mind said childishly. The first time he had seen her, she was wearing it and standing on the bridge at the park, when he had gone for a walk on sunny day. He had never believed in love at first sight but whatever happened to him that day way in-explainable. He had fallen hook-line and sinker for the apparition. Her white skirt had fluttered in the breeze. Her hair was flying all over her face as she looked at the swans gently skimming the surface of the pond. The red sash of her shirt fluttered behind her like a flag. The vision had stayed in his mind and refused to go away. And as they got acquainted and she had moved away she had promised one day she would come back for him. Today was the day. The street had several other people walking, jostling, with their black umbrellas and side-stepping puddles trying to stay dry. Samar lingered on looking around. As he reached the bookshop at the intersection where they had promised to meet, he folded his black umbrella and leaned against the wall, under the awning, surveying the scene before him. People were walking around, a few running to avoid getting wet, and a few standing around waiting for a bus or taxi. A sea of black umbrellas-bobbing around-unknown faces, unknown minds, unknown destinations–he was only a passive onlooker there–waiting in anticipation for that known face and warm smile. He had eyes only for his radiant, sunny goddess, his eyes scouring the sea waiting breathlessly. He knew she would come. He knew she would keep her promise. It was only a matter of time before his prayers were answered. He unconsciously put the palm of his hands on his beating chest to calm the rhythmic palpitation of his heart. Then he saw it and a spark coursed through his being. Among the sea of black umbrellas a lone red umbrella bobbed in unison, yet standing out in its vivacity and color. A glowing smile spread on his face and he chuckled. The distant red umbrella slowly made its way through the sea towards him. So far, yet so near. The warm flush of his blood pounded headily. She had kept her promise. It had to be her. 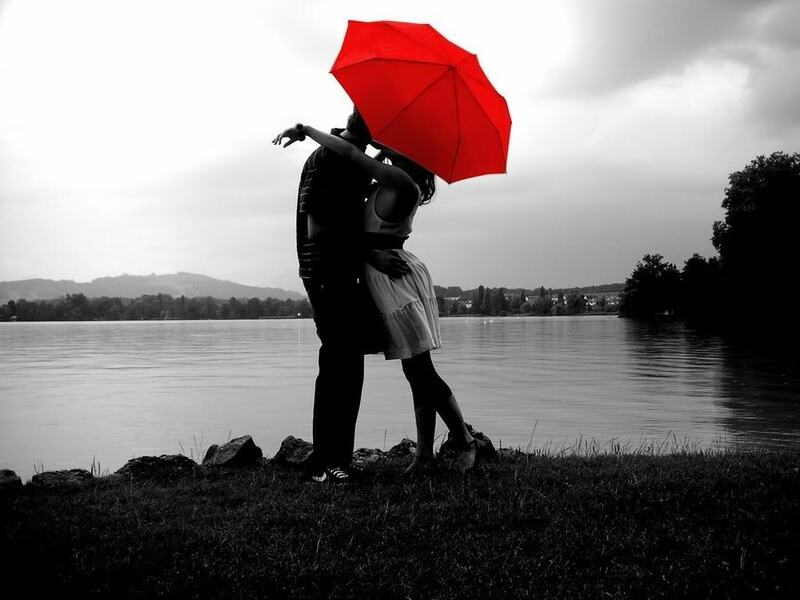 The red umbrella was undoubtedly hers. It made its way hiding the face behind it. The person inched towards him, towards the bookshop as he waited breathlessly. She stopped in front of him. She was wearing the white dress with the red sash, resplendent in all its glory. Her face looked up at him and broke into a luminous smile. Wisps of damp hair clung to her forehead. I am wondering if anyone has this picture in larger format? I am going to draw it for a project and its a little hard to see.